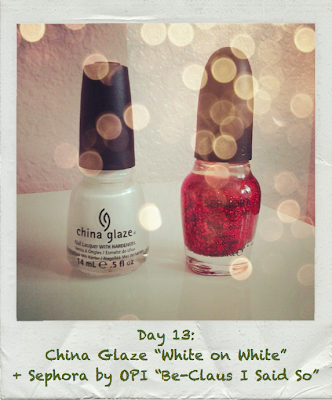 What I Blog About When I Blog About Books: 13th Day of Christmas: China Glaze "White on White" + Sephora by OPI "Be-Claus I Said So"
13th Day of Christmas: China Glaze "White on White" + Sephora by OPI "Be-Claus I Said So"
Today's nail of the day is a fun one. It combines a basic white, China Glaze "White on White" with a chunky red glitter in a clear base, Sephora by OPI's "Be-Claus I Said So." This is definitely one of those manicures that scream 'holiday.' The color combination is reminiscent of peppermint candy canes. Though I forgot to take any close up shots of Sephora by OPI's "Be-Claus I Said So," you can see how it applies on the nails. 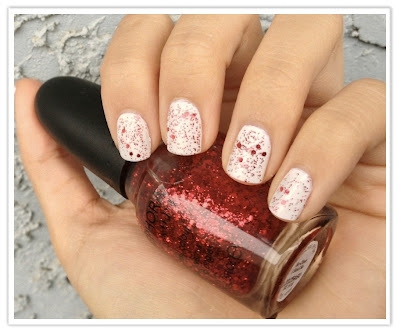 It's made up of two grades of glitter: larger red ones, and a sparing amount of fine ones. 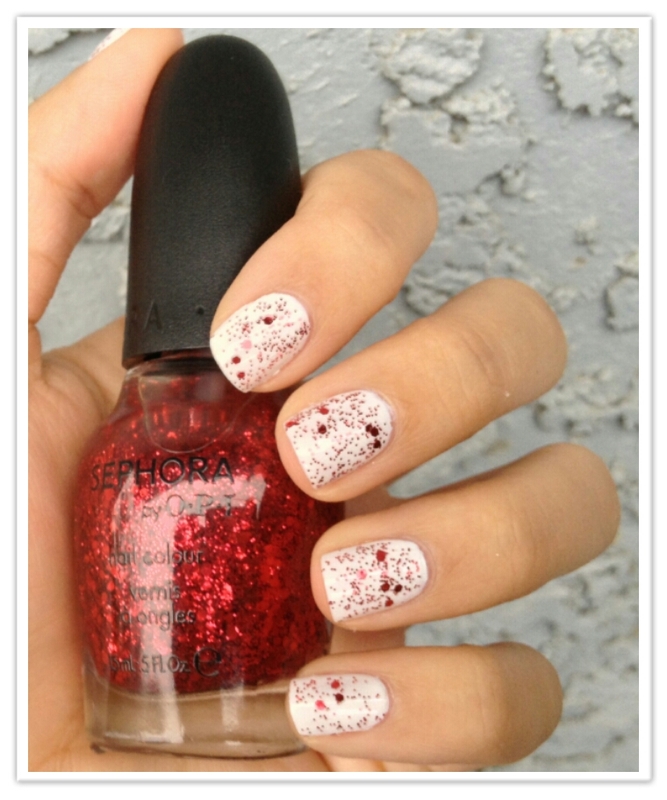 I love how this glitter is actually a top coat, making it versatile to layer over a variety of base colors. Like with most of the manicures I do with white bases, feel free to swap it out with a shimmer-y/glitter-y white for more sparkle. I apologize for the blurry photos. The overcast weather does not work well with my shaky hands. But I think you get the idea of appropriate this polish is for the holiday season. Though I normally change my nail polish every other day to every two days, the amount I've been changing it for this series has even been a lot for me. But I have really been enjoying all the combinations and I hope you have been too!